When embarking on a bathroom renovation, the first thing you must consider is usually not the type of shower or the color of tile you will install. Your first decision is to determine the style of your bathroom and how it complements and enhances the overall style of your home. The style you pick and the design elements you incorporate reflect your personality and are a blank canvas where you can bring your personal tastes to life. The exact style you choose may depend on a number of factors, including your tastes, the available space, and how it gels with the rest of your home style. If you are seeking a sleeker style with no frills and clean lines, then a contemporary bathroom design may be the perfect option for your renovation. 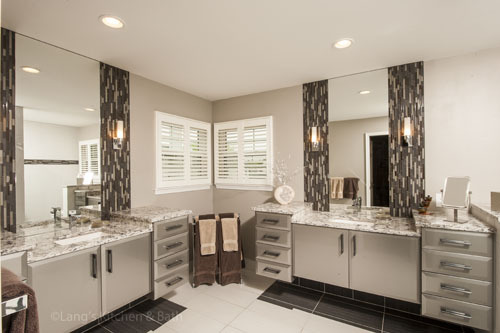 This could involve going for a fully modern style bathroom, or you may decide to incorporate elements of a more contemporary design into a transitional style remodeling project. This allows you to achieve a softer design that still maintains the feel of a more modern style bathroom. Patterns and shapes: contemporary designs aim to streamline your space by limiting extra embellishment and instead focusing on simple, angular lines or flowing curved fixtures, like the elegant tub and fixtures pictured to the right. Geometric shapes or patterns can also bring a modern flair to your design, while adding an element of visual interest. Materials and textures: high quality natural or synthetic materials that complement a more modern style include wood, stone, slate, glass, ceramic, stainless steel, or concrete, like the great concrete sink and countertop pictured below. These materials suit the sleek nature and color scheme of a contemporary design, while also adding an element of texture. Simple colors with a twist: a basic color palette including white, grey, black, and beige are the most typical choices for a contemporary bathroom design, like the bathroom pictured below. These sleek, elegant color choices may be paired with a splash of a more vibrant color or a contrasting dark color to add a visual impact and create a focal point in your design. No frills, clean lines: the beauty of a contemporary design lies in its simplicity, as it removes the excess adornment of other styles and focuses on sleek lines and efficient use of space in an aesthetically pleasing design. This style of bathroom also creates a sense of openness by employing design features such as a floating vanity, sink or toilet which leaves the floor space unbroken. A glass enclosed or open style shower can also evoke the modern vibe while opening up your bathroom space. A contemporary design can work with any size bathroom, but it is particularly useful for maximizing available space in a smaller room. 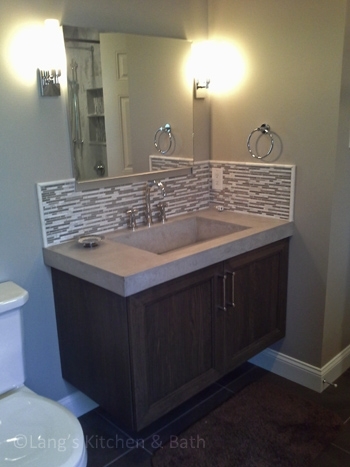 Visit our bathroom design gallery page for more examples of contemporary designs or contact us to learn more.